Consumer Reports said that the new study was “groundbreaking” and encouraged people to take simple precautions to limit their exposures. The histogram below helps tell the story. It’s based on brain tumor data from The Netherlands. The black segment of each column tracks the incidence of glioblastoma multiforme (GBM), the most aggressive and deadly type of brain tumors. 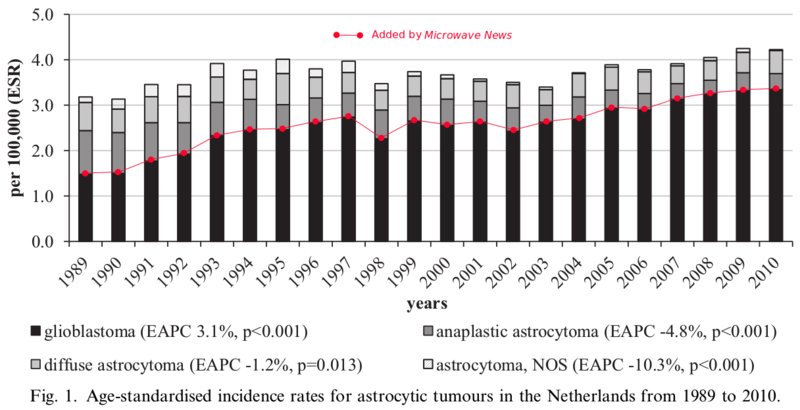 While the total incidence of all types of brain tumors in The Netherlands rose at the rate of only about 0.7% per year, the increase in GBM was about 3.1% per year —that is, the incidence more than doubled over the period 1989-2010. (Follow the thin red line we superimposed on the histogram to track the trend.) This is a statistically significant increase. At the same time, the rate of all the other types of brain tumors went down; these changes are also significant. The higher incidence of GBMs is being masked by the lower rates of the other types of brain cancer. GBMs Are Also Rising in the U.S. The increase in GBMs in the temporal lobe (the region of the brain closest to the ear and potentially to a phone) was seen in all three registries, ranging from approximately 1.3% to 2.3% per year, a finding that is statistically significant. Perhaps, the increasing rate of GBMs seen in the U.S., The Netherlands and Denmark is due to some unknown factor. But, whatever may be going on, GBMs are on the rise. While most cell phone epidemiological studies do not break out the risks for different types of brain tumors, Lennart Hardell of Örebro University Hospital in Sweden has done so. “We have consistently found an increased risk for high-grade glioma, including the most malignant type, glioblastoma multiforme grade IV [GBM], and use of wireless phones,” he told Medscape earlier this month. Hardell’s epidemiological studies were instrumental in IARC’s decision to classify RF radiation as a possible carcinogen. In an e-mail exchange with Microwave News, Hardell confirmed the Medscape quote. He added that he has also found that, in an analysis of 1,678, patients with GBMs in Sweden, those who used wireless phones had shorter survival times. How Big Were the Increases in Tumors in the NTP Study? This is in line with the report the NTP posted online last week in which it called the incidence of tumors “low.” But some observers think the cancer rates among the rats are in fact higher than the NTP is saying. Moskowitz calls the hyperplasia cells “precancerous,” as does John Bucher, the associate director of the NTP, who released the study on Friday. It is commonly believed that hyperplasias will likely later turn into malignant tumors. Moskowitz estimates that while the NTP found tumors in 5.5% of the exposed male rats at the end of the experiment, when those with hyperplasia are included, the rate goes up to 8.5%. “That’s a remarkable finding,” he told Microwave News. If the exposures had continued for longer than two years, the results may have been clearer. During the study planning phase, Melnick argued for running the experiment for at least another couple of months. If he had prevailed, the status of the hyperplasias would have been clearer. He was overruled. Belpoggi and her colleague Morando Soffritti recently released their own large animal study which showed that another type of non-ionizing radiation, ELF EMFs, can promote cancer. They are also in the midst of their own large RF animal study, but it has been delayed by a shortage of funds. Even if the naysayers are right, Melnick maintains that a small risk could result in a large number of people developing radiation-induced tumors. That’s because there is a huge number of cell phone users across the world.